What was it that made you choose your program? 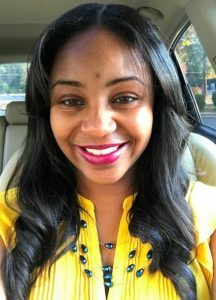 After studying neuroscience and participating in research as an undergrad, I knew that I wanted to continue along that path for my graduate studies. The Neuroscience PhD Program at Wake provided the training I wanted and also allowed me to work with faculty in the Department of Physiology & Pharmacology, which are predominately drug and alcohol abuse researchers. The McCool lab has a long-standing interest in understanding the relationships between drugs of abuse and emotional behaviors like fear and anxiety. My dissertation project uses optogenetic and chemogenetic approaches to investigate cortical synapses in the amygdala following chronic ethanol exposure and the role of these circuits in regulating anxiety-like behaviors during withdrawal. Alcohol withdrawal-induced anxiety has been reported as a common, underlying cause of relapse in alcohol- dependent individuals. A comprehensive understanding of changes that occur in the brain as a result of chronic alcohol consumption, especially in brain regions that regulate emotional responses such as the basolateral amygdala, is critical for developing treatments for alcohol-dependent patients. My studies seek to advance the current understanding of the neural circuitry involved by using rodent models to identify upstream brain regions as potential targets for developing treatments for human alcohol abuse. I initially became involved in alcohol research as an undergraduate and then I went on to work as a technician in an alcohol lab for a year before coming to graduate school, so this has been a long-standing interest of mine. Do you know yet what you want to do with your degree? Short answer: Not exactly. When I began graduate school, my overarching career goal was to earn a tenure-track position at a research-oriented university. However, I have recently become interested in moving away from basic science and into more of a translational role. With that being said, I am committed to conducting high-quality research and leveraging new techniques to address clinically-relevant problems, I’m just not sure what setting that will be in. What advice would you give to first year students, or to high school or college students? I think the most important advice I would give is to make sure you are passionate about what you do. Graduate school is very challenging and can be overwhelming at times- but if you are passionate about what you do and believe in its importance then you will have the motivation to persevere. I’ve also learned that it’s okay to not know exactly what you want to do and even if you think you do, it’s okay to change your mind. It’s always smart to look ahead but important to not let the future worry you in the present. Everything always works out in the end. Thanks Molly! We love your advice! 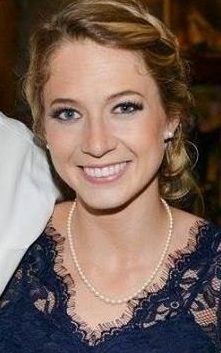 Molly’s NRSA, titled “Dissecting the role of prefrontal circuity in basolateral amygdala physiology and regulation of anxiety following chronic ethanol exposure and withdrawal”, was recently funded. Congrats Molly! You can learn more about the McCool lab HERE. Interested in learning more about alcohol withdrawl, anxiety, and relapse? Visit the NIH. Want to know a little more about how alcohol can affect brain structures? Check out this short ARTICLE from Science Daily. I think the neuroscience program at Wake Forest does a great job at being involved in collaborative research spanning a wide range of relevant clinical topics. My thesis focuses on changes in the brain renin-angiotensin system within the medulla and its involvement in central regulation of blood pressure. What’s the connection between your program and your research? The neuroscience component of course being that my focus is on the brain and its role in blood pressure regulation. The broader implication of my research is to contribute to understanding the concept of fetal programming and neural origins of hypertension and cardiovascular disease that can lead to therapeutic targets for treatment. Why are you interested in your research and / or how did you become interested in your research? Coming to Wake Forest, I knew I wanted to learn biochemical approaches to investigate the brain and understand signaling mechanisms which is what my advisor, Dr. Debra Diz uses. Upon the generation of my thesis, I became excited about the clinical implications and bigger picture which adds to the motivation component. I want to pursue a research focus on neuroepidemiology and investigate the brain renin angiotensin system and cardiometabolic risk factors involved in cognitive impairment/dementia. In addition, my interest is to understand the racial disparity involved in dementia. Take every opportunity available to foster your growth and development whether its research related, professional or personal. For first year students I think networking early can help give insight and outside perspective to your development. Additionally, we’d like to congratulate Alexa on winning first place in the Dolores C. Shockley student poster competition at the Experimental Biology Conference this year. As part of the prize Alexa will be serving on the American Society for Pharmacology and Experimental Therapeutics Career and Mentoring committee. Thanks Alexa! Congrats on your win! Interested in learning more about Dr. Diz’s lab? Visit her page HERE. The Alzheimer’s Association recently held their International Conference in London, England. Four studies were presented highlighting racial disparities in Alzheimer’s Disease. Learn more about those studies HERE. Check out the announcement of Alexa’s win, and learn more about Dolores C. Shockley, HERE. From: Originally San Diego, CA. But I’ve lived all over the country: Washington, DC, Seattle, WA, Omaha, NE, Amelia Island, FL. Knowing my Bachelor’s degrees would likely require a graduate education to get a job, neuroscience was what I considered to be the “marriage” of psychology and biological sciences. I knew generally that I liked the brain, but didn’t really enjoy psychology research that I spent my undergraduate career doing. 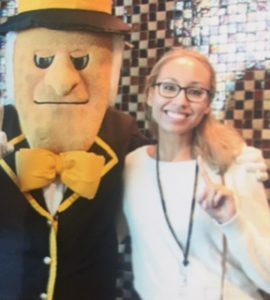 I applied to Wake Forest because it had a Master’s program which would allow me to see if I liked more basic science research without committing 5 years to a PhD program. Generally speaking, my thesis project examines inflammatory responses in amyotrophic lateral sclerosis (ALS, or Lou Gherig’s disease). Specifically, I study inflammatory processes at the nerve/skeletal muscle connection (neuromuscular junction) and peripheral motor nerve axons and how inflammation might affect the progression of ALS. Why is your research important, or how is it novel? Understanding disease mechanisms helps scientists and physicians develop better therapeutics and treatments for patients with devastating neurodegenerative diseases. In ALS specifically, there is no cure and only one effective, FDA-approved drug therapy which modestly extends time to death by about 2-3 months. Examining the disease at the molecular level, paying particular regard to where and when harmful biological processes are occurring, will help to develop more specific and therefore hopefully more effective treatments and medications for ALS patients. With better medications and therapies, we can at the very least improve the quality of life for people who are suffering; ultimately, however, we may be able to delay onset, slow progression, or even cure ALS. On a quick final note: I think all research aspires to this end and that is generally why it is such an important enterprise. The more we know and the more we understand the causes of problems, the better suited we are to address, alleviate or fix those problems. Why are you interested in your research, and how did you become interested in your research? My grandmother had a neurodegenerative disease called Progressive Supranuclear Palsy. My personal interests along with my natural intellectual interests in the brain and disease led me to pursue research in neurodegeneration. What are your plans, once you receive your degree? I actually would like to pursue a career and perhaps further education in the realm of clinical research or public health. Over the course of my time at Wake, my interests have shifted from the laboratory bench-top to more patient and community-level research. My current plan is to work in clinical research as a clinical studies/research coordinator for a few years while I decide what’s next for me. I guess the short answer was not entirely… but I do have a good idea! What advice would you give to first year, college, or high school students? Take charge of your education. Be curious, ask a lot of questions and seek out good, honest mentorship as early as you can. Always follow what interests you and don’t be afraid to admit when something isn’t your style. Not enjoying something does not mean you are a failure—just move on and try new things! Thanks Rachel, and good luck with all of your endeavors over summer!! Interested in learning more about ALS? Visit the ALS Association page HERE or visit Wake Forest’s ALS page HERE. Or, learn more about Huntington’s Disease HERE or Progressive Supranuclear Palsy HERE. 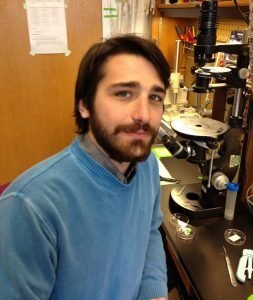 Undergrad Research: The Genetics of Energetic Homeostasis in Drosophila with Dr. Erik Johnson. I was accepted into the MD program first, but quickly realized I have a passion for research so reached out to the then director of the MD/PhD program. I knew I wanted to do neuroscience and had an interest in whole brain electrophysiology. With that in mind I reached out to Dr. Dwayne Godwin, who is the director of research MEG, and began rotating in his lab. Once established in the lab I applied to the graduate school and the MD/PhD program so that I could take leave from medical school to pursue the PhD. My research focuses broadly on the reciprocal interactions between local neural circuitry and whole brain networks. Specifically I use optogenetic manipulations of hippocampus to study coordination of neural activity locally and at upstream and downstream locations. When applied to MEG this work is very methodological in scope; working toward identifying the limitations of magnetic source imaging (MSI) with MEG and the utility of the combination of optogenetics and MSI in functional brain mapping. The rodent work I do using transgenic mice is much more hypothesis driven, focusing on hippocampal hyperexcitability in response to alcohol exposure. For this work I use a combination of optogenetic techniques, developed in our lab by Dr. David Klorig, and 8-channel satellite electrophysiology recordings to generate and record seizure or epileptiform discharges. The occurrence of epileptiform discharge or seizure depends on the excitability state of the hippocampal circuit being activated and so is altered during withdrawal. We use this as a model for pharmacological testing and to ask basic questions regarding the transition from a seizure resistant brain to a seizure susceptible brain following chronic ethanol exposure. Wake Forest has a strong history of research in drug abuse and addiction providing an excellent environment in which to work on methodologies used to investigate the effects of chronic ethanol exposure on seizure. Furthermore, the opportunity to combine optogenetic techniques in non-human primates for imaging in MEG is one that only a very select few institutions could provide. Why or how did you become interested in your research? I have a fundamental fascination with how the brain works from a system wide perspective, and I believe that we are at a point in history when the techniques and computational capabilities have caught up to theoretical musings. By manipulating specific regions of the brain in physiologically relevant ways while recording simultaneously from the whole system (or widespread networks within the system) I think we can begin to understand the rules by which activity in the brain is coordinated. These governing principles should reveal the functional architecture that allows the brain to do all the amazing things that it does. With additional insights from single cell work, neurochemistry, neuroanatomy, and mathematical modeling I am convinced that we are at the cusp of truly revolutionizing our understanding of central nervous function. I suspect that we (neuroscience) will be able to develop a grand unifying theory of brain function that will have explanatory power even in the face of the seemingly disparate functional systems contained within the whole. The small contribution of my work may be to provide experimental models which facilitate widespread electrophysiologic observations of the intact brain. What advice would you give to students in high school, college or their first year of graduate school? Take science seriously and do it because you love it. Be motivated solely by impassioned curiosity and mindfully avoid being motivated by prestige, money, or status. Scientists, I believe, have a moral obligation to serve society by providing, to the best of our ability, glimpses of the truth. Start thinking of yourself as a scientist early and work toward the ideal incarnation of the Scientist. We must let go of our ego and embrace our ignorance; it is our eternal enemy and constant companion on the road to the awesome revelations waiting to be uncovered from the natural world. Thanks Greg, and good luck with your research!! Interested in the MD/PhD program?? While our passion is Neuroscience, there are a variety of graduate tracks that participate in this duel degree program. Learn more here. 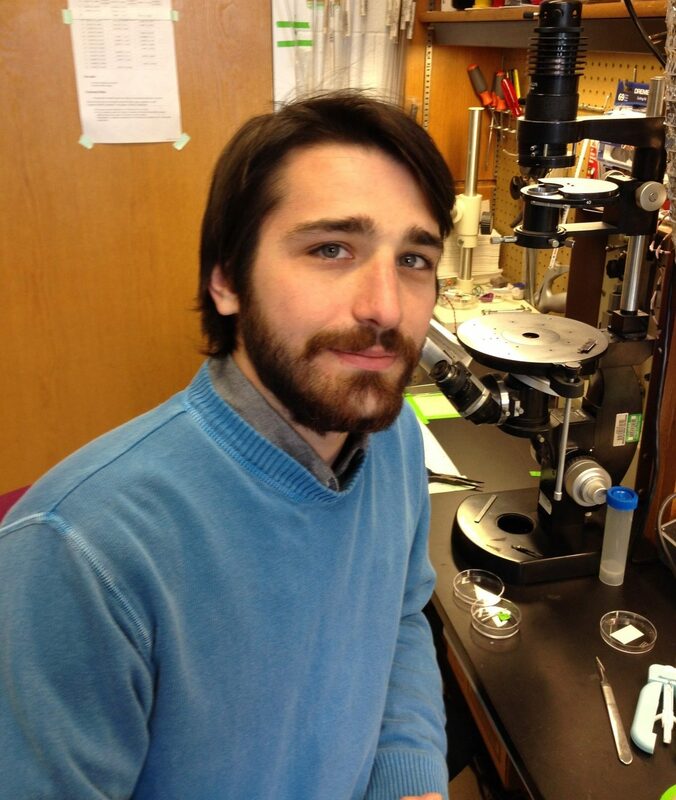 Dr. Godwin’s lab has a variety of awesome projects; find out more about their research here. Greg uses some amazing techniques to answer his research questions. Want to know more about MEG – visit this site from MIT. Think that seizures are fascinating but don’t know much about them? Learn more here at the Epilepsy Foundation. Want to know more about the link between alcohol withdraw and seizures? Start here. 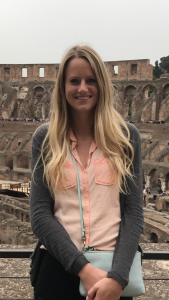 This Month’s Student Spotlight: Emma Vivlamore! Why did you decide to come to Wake Forest and do the 5 year program? What drew to me Wake Forest in the first place was the extremely supportive community. At many other top-tier schools, the atmosphere is so competitive that students don’t help each other and may even sabotage each other. While Wake Forest is still a competitive environment, everyone is so willing to be helpful and see others succeed. I also liked that I am able to pursue science while still getting to take completely unrelated classes that also interest me, such as history and Spanish. I decided to do the five-year program because I wanted to do more with neuroscience than just the minor that Wake Forest offers. This way, I get to learn even more about neuroscience, both academically and via my own research! What is it about neuroscience that excites you? It amazes me how much we still don’t know about the brain. I also did a summer program before my senior year of high school where I took a class on neurodegenerative diseases. Ever since then, I was hooked. I’ve been working with Matthew Fuxjager on the Reynolda Campus for the past year and a half now. Our lab is pretty wide in scope, from ethology to endocrinology and muscle physiology to, of course, neuroscience. We predominantly look at Downy woodpeckers as our model systems, although we use other species of woodpeckers and other families of birds as well. I am especially interested in the brain regions and neural circuitries involved in “drumming”—a woodpecker’s characteristic social and territorial behavior—especially in comparison to songbirds, as well as any effects application of androgens may have on these regions and on overall drumming performance. Why are you, or what made you, interested in this area? My parents were casual bird-watchers while I was growing up, and their interest in birds rubbed off on me. At home, we have at least four or five bird feeders in our backyard, so I’ve always had a fondness for birds. When I joined my research lab last year, I primarily helped collect data for behavioral ecology studies about woodpecker drumming, and that got me thinking about the more specific brain processes involved to coordinate these complex behaviors. Do you have any on what you might like to do with your degree? After I’m done with my Master’s, I hope to go to medical school and specialize in Neurology. I’d also specifically like to focus on neurodegenerative disease like Huntington’s and Parkinson’s and potentially do a bit of patient-oriented medical research in those areas, such as running drug trials or case studies. Have you learned any interesting techniques for studying neuroscience? Do you have any advice for high school students or first year college students who may be interested in science? Firstly… study a little bit every day, not just the night before or even a few days before the test. I know it’s very trite advice you’ve probably heard a thousand times before, but that’s because it’s true. I’ve found that my science grades have always been better when I take the time to study a little every day. Sometimes there’s just so much material, or you have multiple tests in a very short times span (this semester I had four tests in a three-day period…), and doing a little every day is the only thing that will keep you sane. In addition, you don’t have to cram the night before the test, so you can go to sleep earlier and be well-rested! There’s also psychological and neurological evidence to back me up on this. Most importantly, no matter how much you love science, there will be times that you have doubts about the path you’ve chosen. You may find yourself sitting in the library at 10:30 PM, surrounded by index cards and notes on neurotransmitters, questioning your life choices. It’s okay to have doubts, but the best thing you can do is take a break and think about the things you love about science—that amazing experience or fun fact that drew you to it in the first place, or even the fun times you’ve had with your lab group while waiting on a centrifuge. The stress and the doubts will pass if you don’t let them consume you. Thanks Emma, and good luck with your studies!! Visit the Wake Forest University website to learn more about the 5 Year Master’s Program for undergraduate students interested in Neuroscience. Does this research sound AMAZING to you? Take a look at Dr. Fuxjager’s page. The Max Planck Institute has a wonderful site explaining more on the cool technique Emma mentioned, OPTOGENETICS. 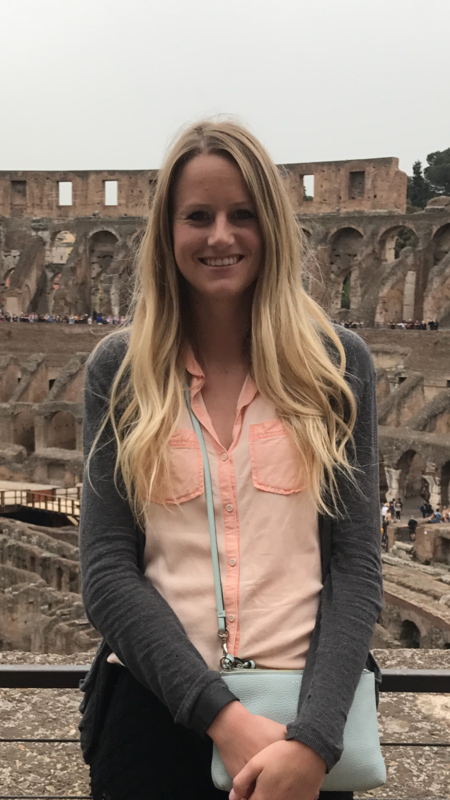 Meet our very first Student Spotlight – Margie Jefferson! I chose my program because of its focus on health disparities. My overall topic is focusing on cognitive decline. My research question will address, among those with and without atrial fibrillation, whether or not stroke associated with increased risk for cognitive decline. What is the connection between your program and your research? There is a connection between my program and research because I will be using data from the REGARDS and CHS studies to address my research question. These studies have approximately 50% minority enrollment so I will be able to evaluate if there are any racial differences specifically the African American population. Why are you, or how did you become, interested in your research? My interest in the area of cognitive decline grew as I was the assistant project manager of a phase 2 multi-center, randomized controlled trial where I had the opportunity to work with participants with mild to moderate Alzheimer’s disease (AD). This study aims to evaluate the safety of the investigational study drug T-817MA and to see if it is beneficial in delaying or altering the decline in memory and daily functioning when given to people with AD. Working with these individuals and their family gave me a new perspective on life. I had heard about AD but I never knew the extent to which it has on a person and their caregiver. Caregivers have to make several adjustments throughout their day always keeping in mind the nature of the disease their loved one is experiencing. Approximately every 1 to 2 months each participant and their study partner would come in for a study visit and complete a series of cognitive test along with other assessments. Upon seeing my participant I was always cognizant that they may not remember me from the last visit. It was very important to me to make sure that they felt as comfortable in a place that to them was unfamiliar. Working with this population taught me patience and increased my passion for greater understanding of what is manifesting in the brains of these people that I have grown so close to. This led me to apply to the Health Disparities in Neuroscience Related Disorders program in hopes that I would be able to understand the science of the progression of AD. I am also passionate about the heart so this directed me focus atrial fibrillation. My research will be supervised under Dr. Timothy Hughes. What advice would you give to high school or undergraduate students? First, believe in yourself that you have the ability to be successful at whatever it is that you are doing. Starting with the right mindset will propel you far! Second, prioritize your course work and don’t procrastinate. Your grades will follow you and impact your acceptance to future programs. Balance is very important so after you have worked hard make sure to relax and have fun with friends and family. Lastly, if there are times when you are struggling in an area don’t be afraid to seek assistance from your program director, professors, classmates, etc. Most of the time people are willing to help out if they are aware of the need. Overall, don’t take for granted the opportunities that you have been given because they will help shape your life and impact the people that you encounter. Thanks Margie, and good luck with your studies! To learn more about Alzheimer’s research at Wake Forest visit our Alzheimer’s Center page. Interested in Health Disparities in Alzheimer’s Disease? Visit the NIH for more information. Check out Dr. Timothy Hughes’ webpage – Margie’s mentor – for more information about his research!